Pattaya’s Alcazar Theatre is offering customers a chance to do some singing of their own at the new Triangle Bar and Karaoke adjacent to the cabaret. Alcazar board member Suthat Phettrakhul welcomed Pattaya Deputy Mayor and the media to the grand opening of the facility built on the site of the former Fin Ism bar on Dec. 23. Triangle offers five soundproof karaoke rooms, four seating up to 10 people and the fifth a large hall that can accommodate more than 100 people for parties or functions. 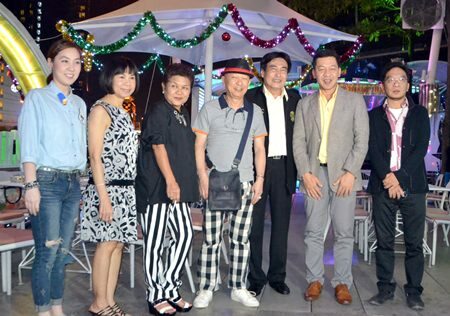 Ronakit Ekasingh (3rd right), the deputy mayor of Pattaya, joins Alcazar board member Suthat Phetctrakul and honoured guests during the grand opening of the Triangle Bar and Karaoke venue on Dec. 23. Triangle sells memberships that include bottles of liquor, karaoke sessions and mixers for prices discounted for the grand opening. Memberships run from 5,000-10,000 baht. A la carte room rates also are discounted for the bar’s opening, with the large hall seeing hourly rates slashed 40 percent to 500 baht while similar discounts apply for longer durations. Lower rates and similar discounts also are available for the smaller rooms.